The newest addition to our product line is the Surveyor APEX tower. The APEX design combines the attributes of the larger Surveyor Senior within a slightly smaller – more wind resistant framework to reduce costs, and to improve upon ability to withstand extreme weather conditions. The APEX deck area has been reduced to decrease wind lift potential and the space-age look shutters are designed to assist in deflecting wind. The exterior shutters when up form the main roof surfaces in front and on the sides of the house structure. The shutters fold down quickly over all window surfaces as well to protect from vandalism. There is plenty of room inside the cabin to shield two lifeguards from the sun and weather. The cabin accommodates two observation chairs, as well as providing counter space and cabinetry. The two side doors, roof, and floor hatches when open provide ample air circulation. The front and side windows have a vertical opening of circa 39” which makes for excellent panoramic viewing capacity. The exterior observation deck is 4 feet deep in front of the window. The deck has circa 64 square feet of walking space not counting that of the interior cabin. The cabin measures circa 6’ x 6’ at floor level and increases in size as it angles outward from window level up providing our roomiest cabin. An exterior fold-down observation bench that secures at night inside the cabin, as well as stainless safety railings around the deck and ramp areas come standard. with side cabinets and fold-out exterior bench seat for front deck. 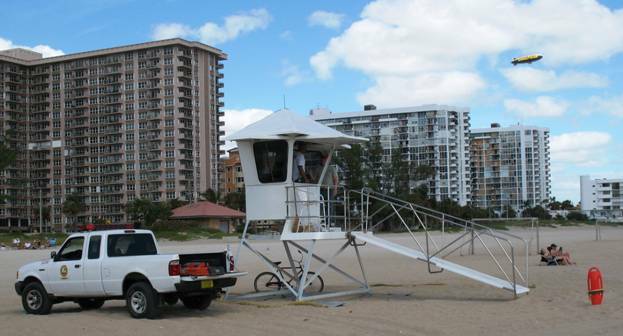 The Surveyor Senior is our original large format tower. The main house measures 6’ x 6’. It has a fixed overhang roof, and our largest deck platform that measures 12’ x 12’ with 5-1/2 feet of front deck depth in front of window. Exterior shutters when up provide additional protection from the sun for the house structure. The shutters and doors quickly and easily close and lock at night providing protection from vandalism. 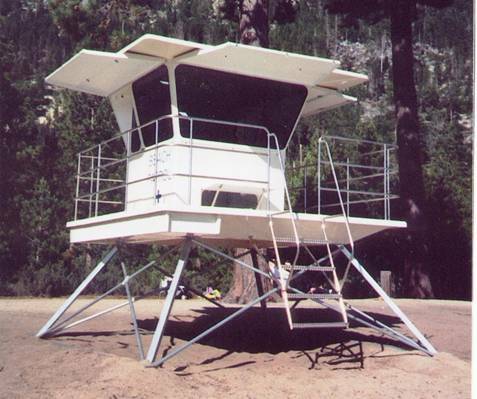 There is plenty of room inside the cabin to shield two lifeguards from the sun and weather. The interior accommodates two observation chairs as well as counter space and cabinetry. The two side doors, roof, and floor hatches when open provide ample air circulation. The front and side windows have a vertical opening of circa 39” which makes for excellent panoramic viewing capacity. The Surveyor Sr. comes with a fold-down observation bench for the front deck that secures at night inside the cabin, as well as stainless safety railings surrounding all deck and ramp areas. 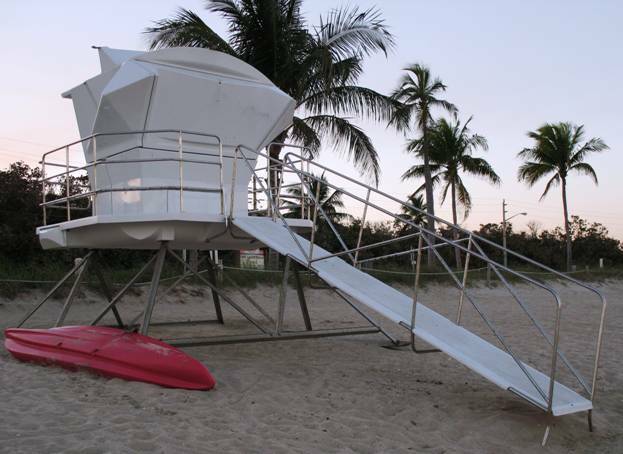 The Surveyor Junior is our most economical lifeguard tower. 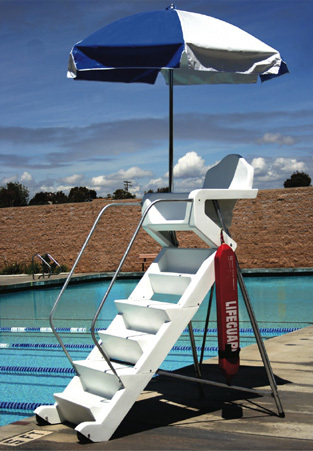 Designed to accommodate a single lifeguard, it offers the same observation capabilities as its larger siblings. It has a fixed overhang roof. Exterior shutters when up provide additional protection from the sun for the occupant. The shutters and door quickly and easily close and lock at night providing protection from vandalism. The cabin measures circa 4’ x 4’ at floor level and increases in size as it angles outward from window level up. A built-in bench seat with back rest comes standard as well as a locking corner cabinet. 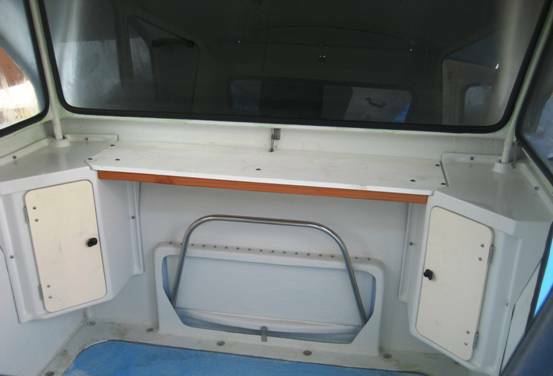 The side door, roof hatch, and floor hatch when open provide ample air circulation. The front and side windows have a vertical opening of circa 36” for excellent panoramic viewing capacity. The standard exterior observation deck is limited to circa 8.5 square feet of standing space exclusive of the interior cabin. The optional large deck increases the walking area to circa 30 square feet and is our most popular configuration. Stainless railings surround the deck and ramp areas for safety. 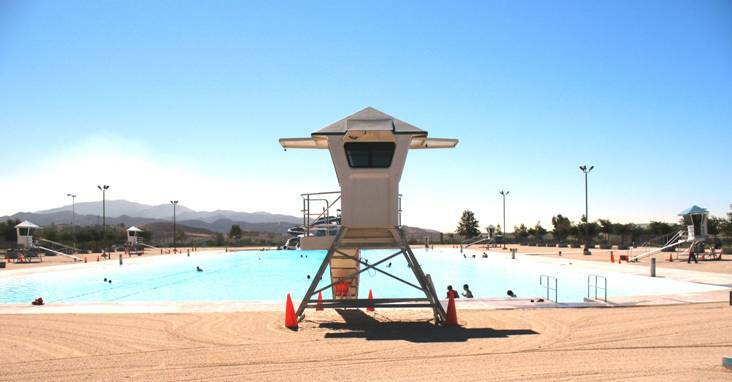 We have numerous Surveyor Junior Towers configured with a special fiberglass elevating mount column deployed at pools nationwide. These are available with or without decks and can be catered to your specific needs. Please call us for more information if this product is of interest. 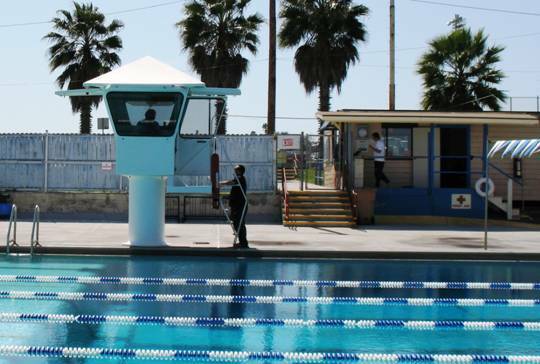 As the leader in the design and manufacture of Surveyor lifeguard observation towers, Industrial Design Research has now developed an innovative LIFEGUARD OBSERVATION STAND. Our new product offers the expected Surveyor quality and durability with many advantageous features. Patent pending copyright all rights reserved.